Fermentation is a basis of Japanese cuisine. The key seasonings, such as miso, soy sauce, venegar, sake, mirin (sweet sake) are all fermented products. Furthermore, tsukemono pickles, nukazuke, natto, also add flavor on daily meals. Some people do not like natto, because of its strong flavor and stinky smell, it is Japanese food culture to have natto on top of rice, typically served with miso soup. 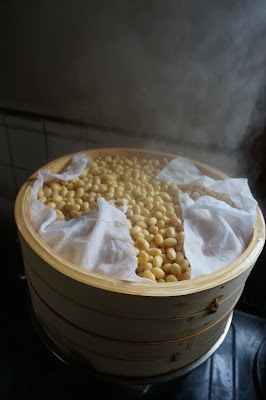 Formally, the first historical record of natto dates back to 11th century, but it is said that natto already existed in Yayoi period (300 BC–300 AD), when beans started to cultivate in Japan. The ingredients are simple; only boild bean and straw, or even any kinds of wild grasses are possible to ferment soy beans. It is said that natto became popular among worrier, since it is handy to bring soy beans to battle field, wrapped by straw, then soy beans got naturally fermented. Natto became commercial products in Edo period (1603 – 1868), and spread all over Japan. 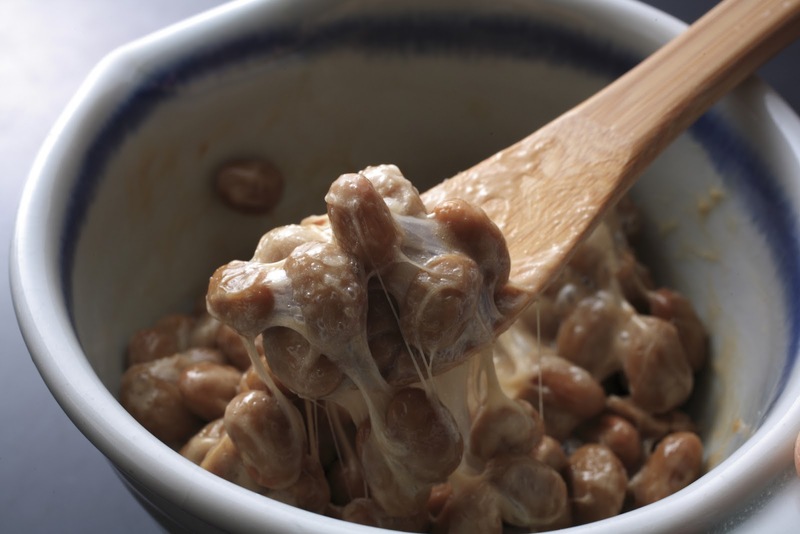 Especially, natto produced in Mito in Ibaragi prefecture is popular. People in the eastern part of Japan more often eat natto, compared to the west. 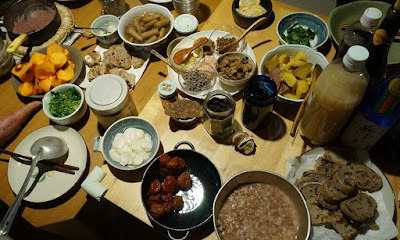 Why fermented foods became widespread in Japan? One of the advantage of fermentation is that harvested crops can be preservable for longer term, especially in rural area, crops can be harvested a lot at one time, and less in winter season. It is required to stock food and prepare for off-season. Also, fermentation adds much more nutrition value as well. Especially, in Japanese cuisine, soy bean products such as tofu, miso, natto are major protein sources. It is fermented with Bacillus subtilis, which grows under the aerobic condition. 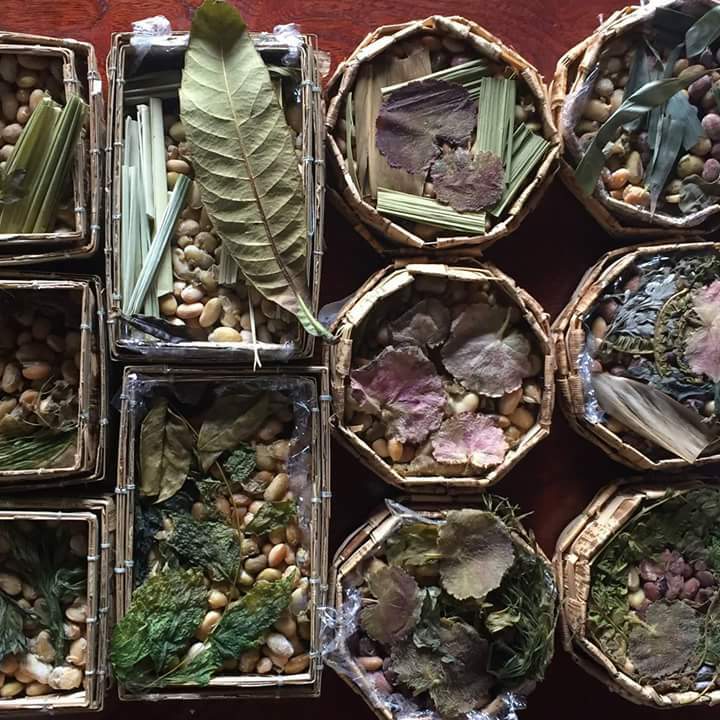 It is very interesting to make various types of natto in combination of diverse beans and plants, from which natural bacteria can be harvested. It should not be always "soy", but it is possible to make natto by using kidney beans, peas, black beans, azuki beans, and even rice, or other grains as well! In Japan, we use rice straw to harvest natto bacteria, however, in other asian countries, various plants are used, for instance, banana leaves are used in Thailand, and in Myammer, it is believed that a certain kind of fern can make the best natto. If you do not like the strong smell of natto, you can also use it as a seasoning.